White acetate plain-weave dress with navy blue printed bamboo and sparrow motifs and light blue printed fish scale motifs. Bamboo, sparrow, and fish scale prints are traditional Japanese motifs. This is a simple one-piece dress with straight-line cuts. The yoke, which continues through to the sleeves, is composed of left and right body sections with no shoulder line. The skirt, beginning with a high waist, is made from two rectangular parts, one for the front and one for the back. 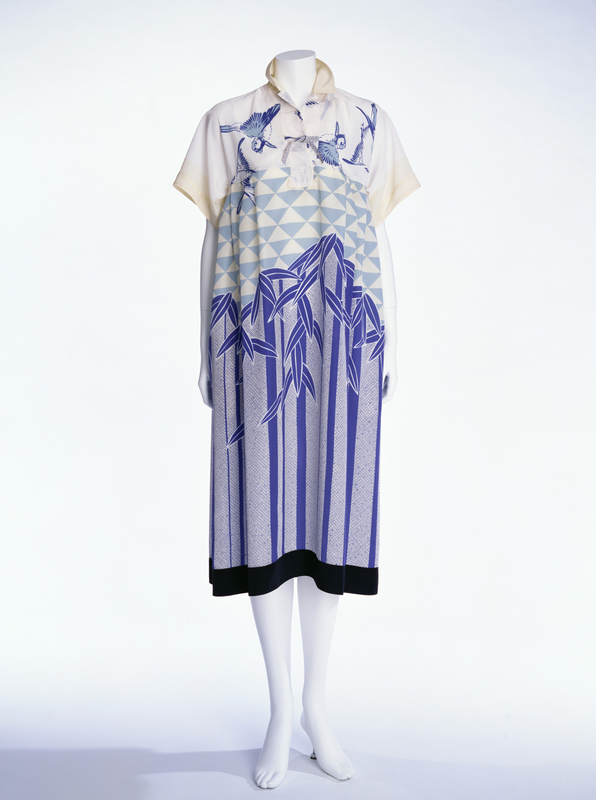 Kenzo Takada produced the Big Look for his Autumn/Winter 1974 collection, and this dress is an extension of that theme. The bamboo motifs are placed on the skirt, aligned with its axis, to emphasize the straightness, giving an elegant impression despite the volume. In 1970s Paris, the effects of the May Revolution were still being felt, and there was still pressure for more freedom. It was the fashion to wear clothes casually, without pretentiousness and without sticking to conventional rules on how things should be worn. This approach can be clearly seen in Takada’s style, which is inspired by Japanese kimono, including everyday kimono and kimono workwear, interpreted as folklore fashion and mixed with Paris style clothes.